Sometimes when you’re hungry, instead of a large meal, all you want is a quick bite along with a steaming hot cup of chai or coffee. Cosy little cafes that have tasty snacks and deserts with a beverage menu to die for, are perfect for this. So we went about and found some of the best cafes in Goa for you to visit this IFFI. With it’s eye catching Greek ambience, Cafe Candolim is the perfect place for a delectable breakfast or a brunch. With fresh and healthy food and an always warm and welcoming staff, this Grecian style restaurant is a must visit. Pick up a book to read along with your meal from the library in the cafe. Fries, burgers, sandwiches and shakes, what’s not to love? Cafe Basil is a cute little hang out where you any play a guitar and sing or read a book along with your meal. They have some of the most reasonable and yummiest food items in Goa. If you love and a good and filling meal that’s value for money, this is the place for you. Saraya Cafe is all about being eco friendly and sustainable so it’s no wonder that most of the produce that they use in their good is organic and grown at their very own farm. They’re are vegetarian cafe but even a non-vegetarian will love their woodfire pizzas that are filled with the freshest toppings and homemade sauces. Right in the heart of Panjim city is Cremeux Cafe & Bistro that’s the perfect to unwind or grab a quick bite from their menu that ranges from desserts and coffees to pizzas and pastas. With its relaxed ambience that offers both an indoor and outdoor setting, this cafe is perfect place to grab a meal for a steal deal. If you’re the type of person who loves fish food and always wants to try something new, here’s the perfect cafe for you! With its classy interiors and an assortment of mouth watering fish food on their menu that will leave you wanting to try them all, this cafe manages to capture goan seafood perfectly and yet have innovated dishes that you’ve never heard of before. 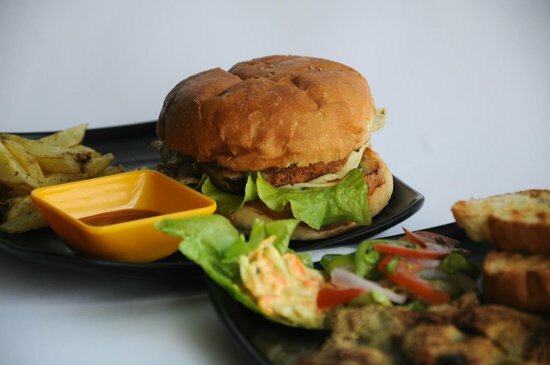 This new, cosy little cafe in Panjim, has been known to cater some delicious hearty food. The Busy Bean Cafe is the best place for some comfort food like juicy filling burgers, cheesy pastas and milkshakes and what’s even better is that everything is for a great price. If you love sweet treats here’s one place that you should try out. With desserts to fill your every want and a section of savory snacks that are just as scrumptious, Carasid is definitely one of the most well known shops in Goa. The best part about all these cafes is that, if you’re a delegate for the 49th edition of IFFI you get a special delegate discount on your meal after showing them your delegate ID. The International Film Festival of India is showcase of talented works of cinema from all around the world and various international and national celebrities come to promote their movie screenings or premieres. Don’t miss out on you chance to watch these movie, attend masterclasses and take part in panel discussions, sign up to be a delegate now!